The publishing company and bookshop E. S. Mittler & Sohn Verlag was originally founded 1789 by Wilhelm Dieterici (1758–1838). It got its name after Dieterici’s son in law, Ernst Siegfried Mittler (1785–1870) in 1816, and it got its current name “E. S. Mittler & Sohn” in 1848. E. S. Mittler & Sohn Verlag rise to “königlichen Hofbuchhandlung” during the German imperial period and became the leading German publishing company of military and philosophical literature. Before the First World War it had a staff of 420 persons and published about 320 publications per year, among other the Militär-Wochenblatt. During the First World War the company printed several military journals, altogether thousands various military prints. E. S. Mittler & Sohn Verlag had published the memoirs of Generalfeldmarschall von Moltke in the end of the 19th century, and after the First World War it published the memoirs of the high-command generals Ludendorff (1919) and von Falkenhayn (1920). During 1925–1944 E. S. Mittler & Sohn Verlag published the 14 + 1 volumes of the German Official History of the Great War, Der Weltkrieg 1914–1918, edited by the German Reichsarchiv (later Bundesarchiv) founded 1919 by the early Weimar Government. Apart from memories of higher ranked officers, E. S. Mittler & Sohn Verlag also began publishing “Fronterlebnisse”, war-memoires. Ernst Jünger was the first author in this series. 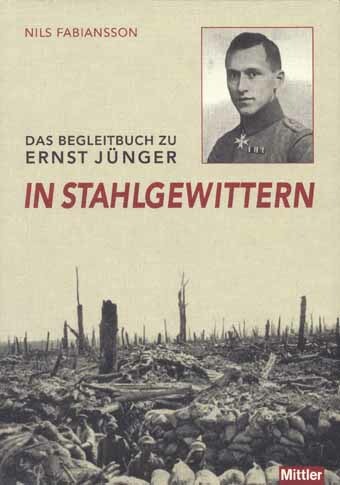 Jünger’s publisher in 1922 was Konrad Toeche-Mittler (1869–1954), the grandson of Ernst Siegfried Mittler, via Siegfried Mittler junior’s sister Johanna Mittler and her husband Theodor Toeche. Einhundert Jahre des Geschäftshauses Ernst Siegfried Mittler und Sohn. Berlin: Mittler & Sohn, 1889. Einhundertfünfzig Jahre E. S. Mittler & Sohn und Buchdruckerei 1789–1939. Berlin: E. S. Mittler & Sohn, 1939. Darmstadt: Toeche-Mittler, S., Verlagsbuchhandung GmbH, 1989.